Over the past ten years, Arizona State University has focused on increasing its research output, making higher education more accessible and focusing more intently on the student. In achieving these results--and in the process becoming the country's largest public university--ASU experienced what it coined a "golden decade", having compressed fifty years of planned evolution into ten. To celebrate and share this achievement with key alumni, supporters and the media, the University and its agency, ArtCraft, worked with Americhip to produce a sleek video book. 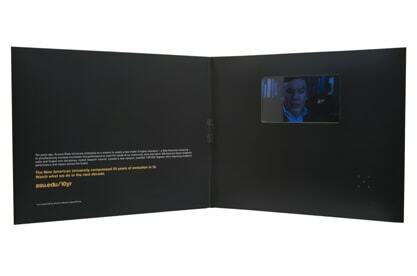 The matte-finished, black video book included our patented 4.3" VIP Screen and was simply titled "The Rise of a New American University." The University created engaging video content that highlighted its claim to be one of the fastest rising universities in the US. "The Video in Print books were fabulous! Delivered on time, they were sent to elite press outlets like US News and World Report and other publications that are important to the education industry and that write about and rank educational institutions. The video books were also given out at a press dinner at the National Press Club in DC and at a similar press event in NYC. Good international press means everything to a university looking to recruit top faculty and students."